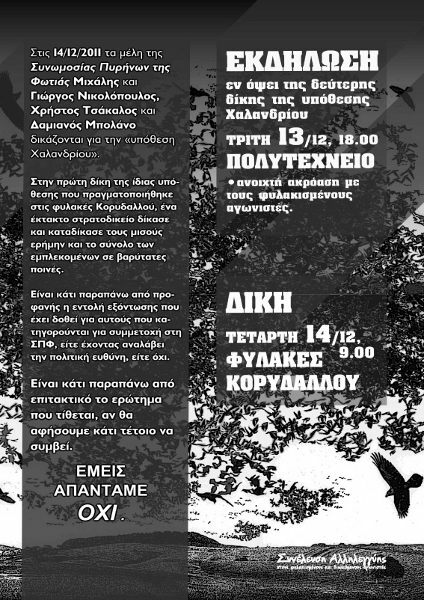 On 14/12/11 the members of the Conspiracy of Cells of Fire Mihalis nad Giorgos Nikolopoulos, Christos Tsakalos and Damiano Bolano are tried for the “Halandri case”. In the first trial for the same case which took place in Koridallos, a special court-martial tried and convicted half of them in absence and all of them to heavy sentences. Its more than obvious the order of extermination given for those who are accused of participation in the CCF, whether they have taken the political responsibility, or not. It is more than imperative the question set, if we will that to happen.